Freemantle Mons the Leviathan Smile is my first story ever to find publication in a print medium, and I couldn’t have asked for a better debut. 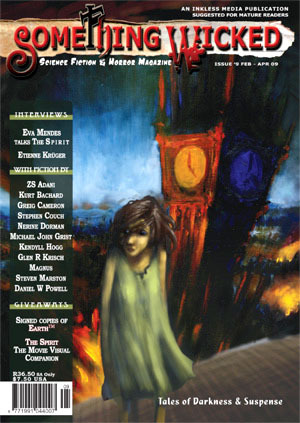 The cover-art on the right is a specially commissioned artist’s impression of a scene from the story: the Grammaton looming up from a city in flames. I had no idea Freemantle was going to take the cover like this- so when I saw it I was effusive in my thanks to both editor (Joe Vaz) and artist (Hendricke Gericke). What an honor- thanks again. You can go buy a copy of this magazine, or calendars featuring the varied artwork- from the Something Wicked site. I have my own copies of the calendar already- they’re pretty great. I won’t benefit from any of the sales as I’m getting paid in magazine copies, but it looks like a very professional enterprise, with thorough editing I can personally attest to, at a very reasonable price. It was 4:59 and a minute from dawn when Freemantle Mons the Leviathan Smile felt the Grammaton clockworkings die.? He was up in the great clock-tower’s belfry alone that night, calibrating old cogwork and balancing up the penny weight piles, a gas revelatory tuned soft and hissing by his side. It was a gradual death.? It spread up from the coils as the unravel slowed, and the 3 story pendulum’s swing faded out.? It shifted along from the swing-banks and stores, and crept the tick-tocking cogs that filled out the walls, and leapt up the belfries from ceiling to floor. It died past Freemantle, it died beyond Freemantle, and Freemantle stood, and followed it go. The Something Wicked link again. You can see my other stories on the Dark Weird Fiction Page. Congrats on the first print publishing and having your story’s commissioned art make the cover. Should lead to more publishing for you? Jason- Thanks bud, it could lead to more if it motivates me to submit more stuff. This story was in the editor’s hands for about a year before this happened. Turnaround in even magazine publishing takes a long time, it seems.